The gravity defying cantilevered design of the Whale Tail Desk was inspired by the natural form of the rare North Atlantic Right Whale, as it breaches in preparation for a deep dive. The lower torso / pedestal is bolted to the floor for stability, while wiring is concealed by an internal "vertebrae" wire management system. 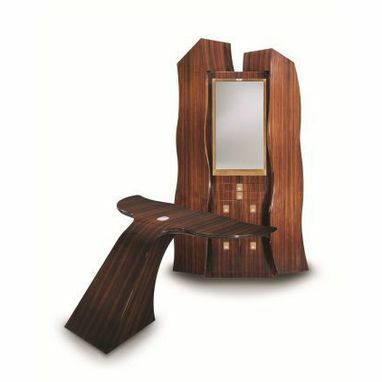 The woods typically used in the creation of this design are FSC certified as being derived from sustainable sources. It is for these reasons that this design is Greenspec listed on my website. 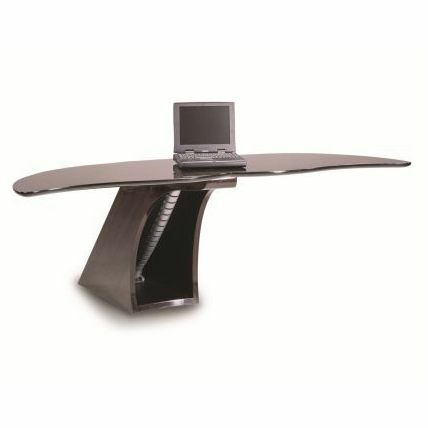 The specifications of the Whale Tail Desk are also consistent with the sustainability standards set out by the U.S. Green Building Council's stringent LEED (Leadership in Energy and Environmental Design) program, namely the MR-7 Credit for certified wood use; the EQ Credit 4.1 for Low Emitting Solvents and Materials; and the EQ Credit 4.2 for Low Emitting Materials, Paints and Coatings.